So this isn’t really a gear review, since I don’t consider the 10 or so miles I’ve logged in my new kicks the requisite amount of mileage to properly review the shoes. However, I thought I’d let you know my initial impressions. Most of you know I’m a big fan of minimalism. I’ve discussed the shoes I wear a couple of times, but you can check out my most “in-depth” post here. My current quiver until Wed of last week consisted of the New Balance MR 10 for the road, the Mizuno Peregrine for the trails and soft surfaces (like nasty mushy spring snow), the Asics Piranha for racing flats, and the Asics Japan spikes for track work. I can remember just five or six years ago, when the choices for minimal running shoes were pretty much limited to racing flats. Everything else was over-engineered, bulky, and just plain ridiculous if you ask me (do you really need a full-sole airbag underfoot when you run?) Fast forward a couple of years, and my, how the tables have turned. If you haven’t picked up the latest Running Times, I highly recommend you do so if you are at all in to minimalism. They also have a new section on the web site dedicated to minimalism. There is a lot of BS and rhetoric out there about minimalism, from ignorant family practitioners who know nothing about exercise phys, to minimalism fascists who push 200+lb individuals into Vibram FiveFingers like it’s a modern panacea. The reality is that the truth is somewhere in the middle, and all completely dependent on the individual and his history, mechanics, and genetics. Everyone has different experiences with minimal shoes, so beware of buying shoes just because Suzy or Johnny Crossfit Level 1 sez they’re the only way to go. Running Times has done a great job of covering minimalism from all viewpoints, and the Spring 2012 Shoe Review is chock full of different options. One of the shoes reviewed in this issue is the Brooks Pure Flow, which I picked up last week and put through some initial paces. Brooks just put out an entire Pure line of shoes, and of course they put out their advertising spin. I never put much stock in a company’s own reviews or media push, because as always, they are a business first. And a biz needs to make money. But you can check their page out if you at least want to understand their Hyrda-esque development mindset resides. Anyway, I picked up the Pure Flow last week because the MR10s are going to be ready for recycling in a a few weeks, having logged several hundred miles since last fall. To be precise, the purchase was actually an exchange for a pair of previously purchased studded Salomon Speedcross 3CS. As a general rule, I have a 10 Mile Out Of The Box test, which is to say that I need to be able to put in a 10 miler on new shoes with no issues. If I can’t, the shoe is either over-engineered for me, or just poorly engineered. The Salomons failed me miserably. For me, they were far too rigid, and narrow for my feet and stride. As a result, after only 13 miles, I developed blisters on the knuckles of my little toes, and my feet were killing me. I’m sure they work well for someone else (they better, at around $135 a pop), but they certainly didn’t work for me. So, back to Skinny Raven I went. I emerged an hour later with these bad boys. They are marketed as being mid-range minimal: a low (4mm-ish) heel-toe drop, but more cush than than the Pure Connect lineup. The latter were far too narrow for my feet, much like the old Nike Free 3.0s, which left areas of my sole supported only by a bulging upper (think of a burger patty swelling outside the bun). So, I ended up with the Pure Flow based primarily on fit. The midsole material is the same for all the Pure shoes, Brooks simply chooses to tweak the patterns and outsole areas. Anyway, enough the technical mumbo jumbo. How did they ride? In a word: Okay. I didn’t have time for a dime on the roads, so I hit the treadmill for some light cruise interval work: 4 x 1M @ 6:00 pace/.5% grade, with 1:00 rest between the miles. The shoes were very comfortable, but my initial impression is that the midsole is too soft for speed work, at least for a 5’11”, 184lb, neutral gait runner (that’s me, in case you were wondering). I hit my splits just fine, but I felt like I was fighting the shoe for speed. It wasn’t nearly as responsive as I like when I’m looking for speed, and I think that’s largely a function of the amount of cushion they put into the shoe. In fact, it reminded me a lot of my old Saucony Kinvara, which were a joke on the track as a result of the mushy ride. Running Times opines it’s an ideal “recovery” shoe, whatever that means, in the latest review and I have to agree at this point. 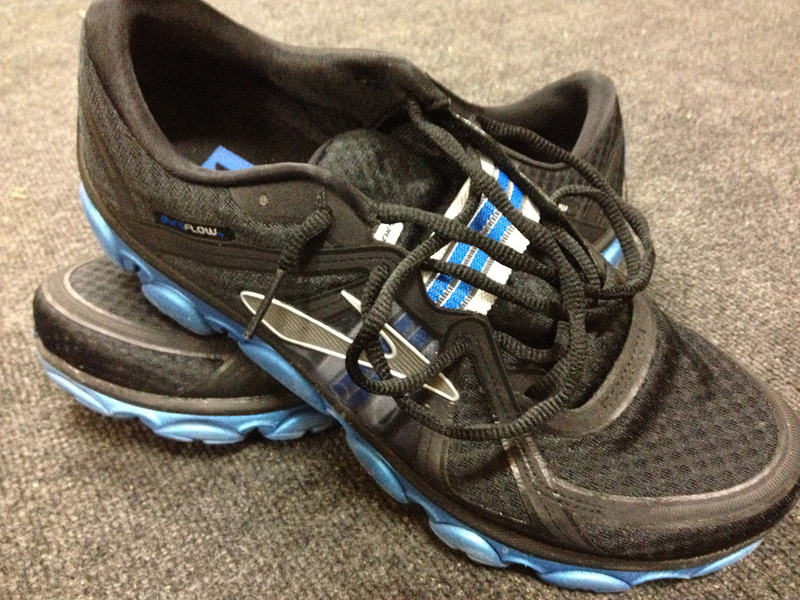 I see this being a good shoe for those day-after or day-of recovery jogs (5-6 miles easy). I’m going to put in some longer runs on the Pure Connect this week and the next, and after about 100 miles on the shoe, I’ll give you my verdict. They feel like they will be fine for longer runs, but the proof is in the pudding. Right now, this shoe is no quiver killer compared to the MR10s, which I have always felt work well for both long runs and faster-paced road work. I’m also planning on picking up the New Balance MR00 today, so expect to hear more on them in the coming week or so. Until then, compadres, keep logging those miles! Or kilometers, if you happen to be reading this in Euro-land.